Pearls of Wisdom is the home of inspirational quotes & wisdom sayings, prayers & affirmations and inspirational wisdom stories - spiritual quotes and inspirational song lyrics to uplift, heal & feed the soul for personal & spiritual growth, self empowerment, inner peace and global peace. Covering diverse spiritual & pagan philosophies, including Native American Wisdom and Buddhist Wisdom, Pearls Of Wisdom aims to re-awaken your consciousness, remember your true inner power, and encourages and empowers women and men to be the best we can be, for ourselves and others. Do some spiritual self-help shopping and also learn about issues that Affect Your Health. Awaken to and assist with global humanitarian, peace & environment issues. and potential - helping to release the "Warrior Woman" within. with ourselves, others & our planet. very applicable in today's times. planet. Things you can do to help. ways of thinking & being. This site isn't just a collection of any old quotes simply for the sake of having quotes. to help inspire, motivate and empower you on your life's path. Learn how to free yourselF! your bliss, doors will open for you that wouldn't have opened for anyone else. Learn How to Be a Conscious Creator and re-shape your life experiences. 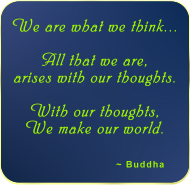 Your thoughts create your reality, and You choose your thoughts. Therefore, you have the power to create your own reality! If your life isn't working for you, change your thoughts and re-create your life (your reality) for more success & happiness! The first spiritual law of success is the law of pure potentiality. This law is based on the fact that we are, in our essential state, pure consciousness. Pure consciousness is pure potentiality; it is the field of all possibilities and infinite creativity. Pure consciousness is our spiritual essence. Being infinite and unbounded, it is also pure joy. pure knowledge, infinite silence, perfect balance, invincibility, simplicity, and bliss. This is our essential nature. Our essential nature is one of pure potentiality. You create your reality according to your beliefs. Yours is the creative energy that makes your world. There are no limitations to the self except those youbelieve in. "The Kingdom of Heaven is not a place, but a state of mind." through human instruments equally imperfect." "For the man who prays in his heart, the whole world is a church." "If the only prayer you ever say in your entire life is "Thank You", it will be enough." Copyright © 2002- www.sapphyr.net All rights reserved.